March 17 is the feast day of Saint Patrick, one of the patron saints of Ireland (along with Brigid of Kildare and Columba). Patrick was a Roman British-born missionary, probably in the fifth century, said to have converted Ireland to Christianity. Historians think most of his converts were among the aristocracy, and it's not clear that the common people changed over from their ancient paganism until later, but he gets the credit in legend at least! The little shamrock is not the official symbol of Ireland (that honor goes to the Celtic harp), but around the world a green clover or shamrock is associated with Eire. Legend has it that St. Patrick used the three-leaved shamrock to teach the pre-Christian people of Ireland about the Trinity. There is no evidence in his writings that St. Patrick actually did this, but he did incorporate ancient pagan Celtic symbols and practices which made Christianity more easily accepted by the people of the land. He is also said to have approached the Irish as an equal rather than a superior, which made his Irish audience more receptive to his message. The color green is of course a sacred color for pagans, and a symbol of life (appropriate on March 17, when spring is imminent!) The "wearing o'the green" originally referred to wearing a shamrock on one's clothing to show solidarity or identity with Ireland -- or the Irish independence movement. During the reign of Queen Victoria (when Ireland was actively fighting English rule) this practice was actually outlawed. St. Patrick's Day came to America with early Irish immigrants. St. Patrick's Day was celebrated in America before the United States was even a nation! 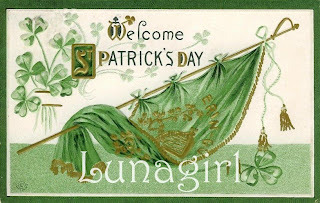 The first St. Patrick's Day in the colonies was in Boston in 1737, and New York City's parade dates to 1762. 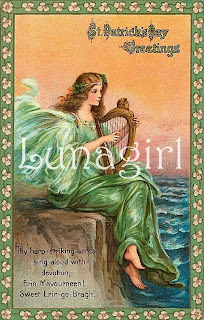 The name Ireland is the anglicized version of Eire, from the name of the Celtic goddess Eire or Eriu (Ireland = Eire's Land). Ireland was never completely conquered by the Roman Empire. Even during the Dark Ages, when ignorance engulfed Europe, learning and literature survived in Irish monasteries. Poetry in Irish represents the oldest non-Latin poetry in Europe. Over 12% of the U.S. population reports Irish ancestry. Halloween came to America in the 1840s with Irish immigrants. Legend says Patrick drove the snakes out of Ireland but... Ireland never did have any snakes. Thanks for this information. I always enjoy visiting this blog!